The Mini-Martians have landed! 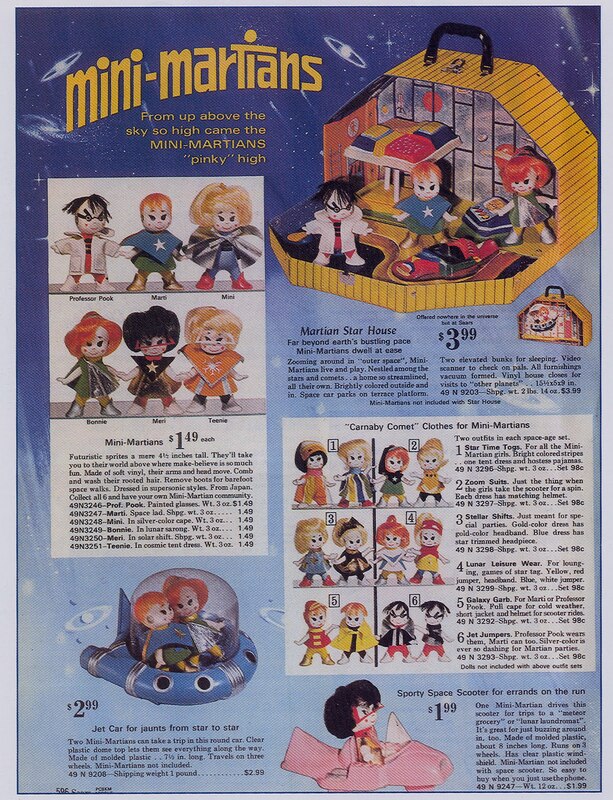 I've finally snagged one of the hardest to find and most sought toys on my wish list: the Mini Martians, made in Japan in 1967 by Swedlin as an exclusive for Sears department store. A perfect confluence of the mid-1960s mod, space-race, and small doll fads, the Mini-Martians were 4 1/2 inch tall vinyl figures with moveable arms and heads, dressed in day-glo "Carnaby Comet" fashions. 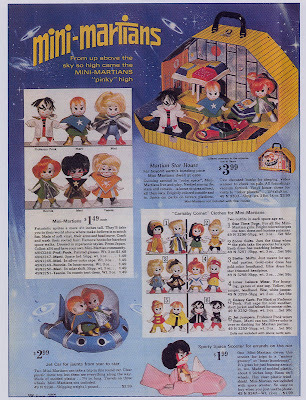 Like so many dolls of this period, the Martians had a vinyl dollhouse with a vacuum-formed, brittle plastic interior. Their scarcest accessory was a blue flying saucer car. Made for such a short time for a limited marketplace, and from fragile materials, the Martians are rare finds today. The Mini-Martians Star House, 15 1/2 inches wide. Inside the Star House, the Mini-Martians had a sleeping loft, closet with space suits, a space viewer screen, a panoramic window with a lovely view of the galaxy, and a parking terrace for an (attached) jet car. Far beyond earth's bustling pace Mini-Martians dwell at ease. Zooming around in 'outer space,' Mini-Martians live and play. Nestled among the stars and comets...a home so streamlined, all their own. Brightly colored outside and in. Space car parks on terrace platform. Two elevated bunks for sleeping. Video scanner to check on pals...Vinyl house closes for visits to 'other planets.' "
This toy came out a few years before I was around, but if I had been, that dreamy ad copy alone would have sold me. Who wouldn't want to live in a house of her own nestled among the stars and comets? Closet with space suits hanging on the wall. Star Car parked on the terrace. Futuristic sprites a mere 4 1/2 inches tall. They'll take you to their world above where make-believe is so much fun...Remove boots for barefoot space walks. Dressed in supersonic styles. From Japan. Collect all 6 and have your own Mini-Martian community." I'm a few short of a community, but was lucky to find 2 in minty condition (with their boots, even! ), while the house came with a couple of more-played-with Martians. Professor Pook appears to be the villian of the bunch. in her odd space visor, is one of the girls. And here is the seldom-seen "Jet Car,"
for jaunts around the universe. Magnificent! This set is a great reflection of the times I guess. It's almost got a true outsourced vibe to it with Sears using it exclusively. It would be interesting to see how that all played out with arranging the product line. That little blue space car is too cool. The vinyl "house" brings back lots of memories to me of the many, many vinyl Hot Wheels and Matchbox cases for all my cars (which all disappeared - ugh!). Thanks! Glad you liked it. I agree, it's a great reflection of its time, and just a fantastic toy all around. I have three of these dolls from when I was a kid. I love them even though they are a little worn out. You have a great collection! Thanks! These are some of my favorite things in my collection. Wow: that's an out-of-this-world (hee hee) junk shop find! That would be a 3 figure item now. Congrats! I had those as a child and played many an hour with them. Unfortunately I sold them over twenty years ago. Supposedly they are in a toy museum in Wisconsin.